We have completed a dose proportionality study using the lowest strength to the highest strength of a modified release formulation of a class I drug. The approach used was the usual cross-over design with 20 subjects (AB, BA) and dose normalized the PK parameters Cmax and AUC0-T prior to bioequivalence. No problem we are BE comfortably within the limits (0.8-1.25). I use Phoenix WinNonlin V6.4 so the within subject and between subject variance values for Cmax and AUC0-t appear in the output. Another worker has used the power model with the same data set for dose proportionality as described by Brian Smith in Pharmaceutical Research in year 2000. The paper is entitled "Confidence Interval Criteria for Assessment of Dose Proportionality". The point estimates are much the same as my approach, but he quotes 98% CI. His CI values are also within the lmits. This worker has also calculated within subject and between subject variance values for the parameters. There are large differences for the values of within subject variance compared with my approach, but the between subject variance values are very similar for both Cmax and AUC. Should the within subject and between subject variance values of Cmax and AUCC0-t be very similar for both approaches? » We have completed a dose proportionality study using the lowest strength to the highest strength of a modified release formulation of a class I drug. The approach used was the usual cross-over design with 20 subjects (AB, BA) and dose normalized the PK parameters Cmax and AUC0-T prior to bioequivalence. No problem we are BE comfortably within the limits (0.8-1.25). Testing only two levels for dose proportionality is somewhat unconventional. Does it look like this (high dose = 8× low dose)? Numbers? AUC only – Cmax is of limited value in DP. » […] but he quotes 98% CI. 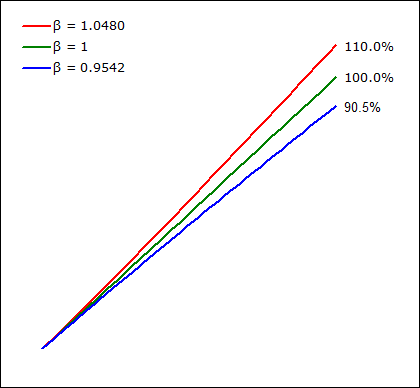 Smells of Bonferroni’s adjustment for four simultaneous (and independent) tests in order to control the familywise error rate: 100(1–2α/4) = 97.5% CI and FWER 1–(1–α)4 = 0.0491. In the power model we have only two parameters (the coefficient α and the exponent β: E[D] = α·D β (independent from the number of dose levels tested) and we are interested only in β. I don’t see why a multiplicity-adjustment was done. » His CI values are also within the lmits. How did he get a CI of β? With two dose levels we have zero degrees of freedom for a model with two para­meters. Before we can discuss variances, we need more information. Hello: It is a very well known drug and many MR formulations are on the market. (You have experience with this drug). All except one formulation show dose proportionality from lowest to highest strength. The one which does not is almost dose proportional. We used that in our clinical protocol to justify our study design of using just two doses. We do have intermediate doses between the low and the high. LnPK=B0+B1*Ln(dose) where LnPK pertains to Cmax or AUC. So we have a regression line going through the points: we evaluate the slope (B1), intercept and the confidence intervals about the slope to evaluate dose proportionality. Brian Smith in Pharm Research year 2000 has extended the approach from the original UK working party. It seems that you can calculate intrasubject and intersubject variance e.g. for AUC and partial AUC from this approach. I do not follow how to do it. I use the usual intrasubject and intersubject values from Phoenix WinNonlin 6.4 and I am happy with that. » It is a very well known drug and many MR formulations are on the market. (You have experience with this drug). If we are talking about the same goody: Watch out for polymorphism… Sometimes you have poor metabolizers in the study where enzymes get saturated at higher doses. In one subject I once got a slope of 1.54 for AUC and 2.16 for Cmax over a only twofold dose range! For the other subjects it got 1.05 and 1.02 with a very narrow CI. » LnPK=B0+B1*Ln(dose) where LnPK pertains to Cmax or AUC. » and the confidence intervals about the slope to evaluate dose proportionality. This is beyond me. df = n – p where n is the number of data points and p the number of parameters. How can you calculate a CI with df = 0? » Brian Smith in Pharm Research year 2000 has extended the approach from the original UK working party. Yep. Smith et al. use a mixed-effects model, where subjects are a random effect. Thus we increase n. Now a CI is possible even for p = 2. » It seems that you can calculate intrasubject and intersubject variance e.g. for AUC and partial AUC from this approach. » I do not follow how to do it. I use the usual intrasubject and intersubject values from Phoenix WinNonlin 6.4 and I am happy with that. If you are happy with that, what is your question? If you want to reproduce Smith’s results in Phoenix/WinNonlin: Start with a worksheet (columns subject, dose, Cmax, AUC, whatsoever). log-transform: dose, Cmax, … and weight=1/logCmax, … Send to LME. Map Subject as Classification, logCmax as Rgeressor, and logCmax as Dependent. 0.7617 (90% CI: 0.6696, 0.8539), slightly different from the reported 0.7615 (0.679, 0.844). Why? Duno. See also chapter 18.3 in Chow/Liu. Without explanation they recommend a 95% CI but a 90% CI in elaborating Smith’s approach. In general I prefer a weighted model (hence the transformation above). Fits much better. PS: Can you ask “the other worker” why he/she calculated the 98% CI? Helmut: My apologies it is a typo it is 95% not 98%. Yes; I am happy with the Phoenix WinNonlin calculations for within subject and between subject variance. The reason for my interest is the other worker following Smith's method is producing values, which are much lower than my Phoenix values for within subject variance. It seems to me that the values from the two methods should be much the same? We will be speaking next week and I am going to ask him exactly how he derived his values for the data set. We each have the same data set. He got the data from me. Obviously the other worker is producing a set of values that are much lower and make the formulation appear to have lower within subject variability. Thank you for above steps: I do see that LnCmax cannot be both the dependent and the regressor (I think LnDose is the regressor). I have tried to run the linear mixed effects model, but I cannot repeat your results. The program ran, but my residual variance was 0.154. I am thinking that maybe my input file does not have the structure needed, e.g. subject 4,5,6 in the Smith Data were treated at 50mg and 250mg so do you need to differentiate by including a period 1 and period 2 variable in the input file? Helmut: I am having difficulty with Phoenix: I get an error message when the program loads relating to a missing framework. It tells me that the program may not work properly. However I have been able to get your file to run OK eventually. It is a dose escalation study....very early development. No study design per se is given. After this success I then tried the data set I have already studied for dose proportionality by dose-normalized BE in Phoenix. There are only two doses given to 20 subjects cross-over design. So using your structure I set up the input for LME model. The model was lndose as given by you. I was able to get an evaluation for residual error for both Cmax and AUC0-t. The values were indeed very similar to what I had obtained in PHoenix (e.g. Cmax CV(%) was 19.9 compared with 20.06 (BE result). The CV(%) for AUC0-t ws 12.2 compared with 12.6% by BE approach). Other worker has reported CV(%) of 0.1 for AUC0-t. I am wondering if using SAS you can get a result of 0.1. For Cmax other worker reports CV% 10.1. I do not think using SAS can give such a difference? » I am having difficulty with Phoenix: I get an error message when the program loads relating to a missing framework. It tells me that the program may not work properly. Environment: Windows 7 Pro SP1 (64bit) build 7601, Phoenix 64 build 6.4.0.768, .NET Framework 4.6.1 (last security update 2016-05-11). Since I didn’t change my Phoenix-installation I suspect Billy-boy causing the trouble… I guess one of these February/March security updates are the reason: KB3122661, KB3127233, KB3136000. » I was able to get an evaluation for residual error for both Cmax and AUC0-t. The values were indeed very similar to what I had obtained in PHoenix (e.g. Cmax CV(%) was 19.9 compared with 20.06 (BE result). The CV(%) for AUC0-t ws 12.2 compared with 12.6% by BE approach). » Other worker has reported CV(%) of 0.1 for AUC0-t. I am wondering if using SAS you can get a result of 0.1. For Cmax other worker reports CV% 10.1. I do not think using SAS can give such a difference? Never seen that. We cross-validated Phoenix/WinNonlin and SAS many times. I think that he/she screwed up completely. I love “push-the-button” statisticians reporting a 0.1% CV (‼) without hesitation. How plausible is that? Good morning! Body height can be measured pretty precisely. Ask the worker whether he/she thinks that repeated measurements can be done to ±1/16″. If the answer is yes, ask which variability he/she expects in AUC. » Body height can be measured pretty precisely. Ask the worker whether he/she thinks that repeated measurements can be done to ±1/16″. If the answer is yes, ask which variability he/she expects in AUFC. Yes; we are still in 1/16" units here. They are difficult to work with. It is highly unlikely for 0.1% to be correct. Sometimes people will believe what they find to be the most favorable. I will be finding out more soon about the other data. Meanwhile I wonder if Pharsight can come up with a SAS comparison. Meanwhile I am off to visit a German store "Aldi"
And this isn't just a case of someone confusing raw figures with percentages? » And this isn't just a case of someone confusing raw figures with percentages? Thank you for your remarks: we will hopefully find out soon. » 0.7617 (90% CI: 0.6696, 0.8539), slightly different from the reported 0.7615 (0.679, 0.844). I have repeated the above calculation in NCSS as desribed by Jerry: here are the results of Brian Smith's example. Name (Beta) Error Level of Beta of Beta DF No. The within subject variance was 0.0146 (the same as Phoenix). Results by NCSS and Phoenix/WinNonlin are similar but don’t match SAS (whose CIs are wider). I love software. » Results by NCSS and Phoenix/WinNonlin are similar but don’t match SAS (whose CIs are wider). I love software. Is it possible to make a dataset for validation? Do we have anywhere the reference dataset and the accurate result? » » Results by NCSS and Phoenix/WinNonlin are similar but don’t match SAS (whose CIs are wider). I love software. » Is it possible to make a dataset for validation? Do we have anywhere the reference dataset and the accurate result? Extract some model diagnostics: DF's and LogLikelihood, and compare to find out which result is the better candidate. » Extract some model diagnostics: DF's and LogLikelihood, and compare to find out which result is the better candidate. Estimates and their SEs are exactly the same. CIs are not (due to different DFs?). PS: An ideas how to weight by 1/log(Dose) in lme()? Suggested by Chow/Liu and gives me a better fit in Phoenix. » Estimates and their SEs are exactly the same. CIs are not (due to different DFs?). DF, p-values, CIs not reported in lmer for the reasons stated there. Some reference for lmer can be found in this PDF. For DFs, p-values, ...: library lmerTest can be used, see this PDF (page 2 - description, details, references to SAS). library(lmerTest) # Library includes modification of function lmer (if I am not mistaken). I think there is a little bug in df visualization - rounded on 3 decimal places, visible on 5 (actually I have not the latest version of R). » DF, p-values, CIs not reported in lmer for the reasons stated there. » I think there is a little bug in df visualization - rounded on 3 decimal places, visible on 5 (actually I have not the latest version of R). Same in R 3.2.5 and lmerTest 2.0-30.
summary(muddle, digits=8) doesn’t help. Or as Carl Witthoft wrote: IMHO the proper use of summary is indicated by its name: a way to get a quick-look at your data. Since I trust most in Phoenix and R; given the width of the CI: Is NCSS too conservative and SAS liberal? Unfortunately we don’t have Smith’s code. Would be great if one of our SASians could jump in. » ... Would be great if one of our SASians could jump in. Smith et al. used ML (usual maximum likelihood) as estimation method! Degrees of freedom method is per default "containment" (7 for the intercept, 5 for the regression slope). Astonishing enough I couldn't reproduce their results w.r.t. to the 90% CIs to a sufficient degree of accuracy with this ddfm method, at least sufficient for me. Choosing ddfm=SATTERTHWAITE gives the desired results. Bingo! Same as R lmer() and Phoenix/WinNonlin, at least with 4 decimals, SAS default output format. Too lazy to tease out more numbers . My preference is REML/Satterthwaite because one could reproduce results in three different software packages. I would avoid NCSS; no idea how the calculation is done. » My preference is REML/Satterthwaite because one could reproduce results in three different software packages. That's not really a reason. Five SAS implementations are as correct as one . "For balanced data the REML method of PROC MIXED provides estimators and hypotheses test results that are identical to ANOVA (OLS method of GLM), provided that the ANOVA estimators of variance components are not negative. The estimators, as in GLM, are unbiased and have minimum variance properties. The ML estimators are biased in that case. In general case of unbalanced data neither the ML nor the REML estimators are unbiased and they do not have to be equal to those obtained from PROC GLM." The first sentences seem to point to an advantage of REML over ML estimation, left the question of the ddfm aside. » » My preference is REML/Satterthwaite because one could reproduce results in three different software packages. » That's not really a reason. » The first sentences seem to point to an advantage of REML over ML estimation, left the question of the ddfm aside. Yep. In dose proportionality quite often (much) more levels than in BE come into play. The highest I have seen so far were five. Unbalanced & incomplete data are more the rule than an exception. That’s why I would prefer REML. OK; REML is a subset of maximum likelihood. Since in this post you reported 9.2 degrees of freedom for the intercept and 5.9 for the slope, why do NCSS’ 90% CIs not agree with the other packages (only the PEs)? Maybe Jerry could register here instead of playing Chinese whispers. » Since in this post you reported 9.2 degrees of freedom for the intercept and 5.9 for the slope, why do NCSS’ 90% CIs not agree with the other packages (only the PEs)? According to provided results, there are differences in Standard Errors. So I guess the differences of 90% CIs are due to SEs. You know [Lower Limit,Upper Limit] = PE ∓ SE*t(1-alpha,df). It seems like only SEs differ from other softwares in the right side of equation. » My preference is REML/Satterthwaite because one could reproduce results in three different software packages. I would avoid NCSS; no idea how the calculation is done. We have looked into this and resolved it in our own minds. NCSS uses the Kenwood-Rogers method for degrees of freedom which is an extension of the Satterthwaite method. » We have looked into this and resolved it in our own minds. NCSS uses the Kenwood-Rogers method for degrees of freedom which is an extension of the Satterthwaite method. Really? Still I can’t reproduce results of NCSS in R (data prepared like in this post). As zizou suspected in this post there are differences in the SEs (therefore, we get different CIs even if DFs are identical) – which leaves the question open why they are different when compared to the other packages. NCCS seems to use Satterthwaite’s DFs and not Kenward-Roger’s (contrary to the documentation and what Jerry told you). First: Happy New Year to You and to All. Late but hopefully not too late insight. As I sometimes stated: All answers (of asked or not asked questions) are here. You only have to dig out what you are interested in. » Recently I was helping one of my colleagues for dose proportionality study and power model in Smith's article is the preferred method. While I did figured out the "correct" degree of freedom method and reproduce all reported results such as intercept, slope, and 90% CI of those values, ρ1, ρ2, the ratio of dose-normalised geometric mean value Rdnm,..., I could not figure out how Smith obtained the 90% confidence interval for Rdnm (0.477, 0.698). Can you please elaborate where your difficulties arose? Able to obtain a point estimate of Rdnm but no 90% CI thereof? For me this is a dubious description (the whole paragraph) I don't understand at all. Difference in log-transformed means of what? Use this with the point estimate of beta1 from your model and its 90% CI limits and you obtain the 90% CI of Rdnm if I'm correct. Here's my attempt to visualize the results of lmer. I tried to add the acceptance criteria to the plot. What do you think? Is that suitable? Did I understand the article correctly? I must confess that I don't understand what you do here with the last two points. Dose dependent acceptance limits . Could you please elaborate and enlighten me? With simple words please, not with complex sophisticated code. The prediction area is calculated based on the dose values used in the study. Should it not calculated on interpolated dose values to get more smooth area borders? And why do you used the prediction interval as a fit visualization? AFAIK is prediction for future observations, but I think we had the goal to visualize the fit of our current observations. So would it not better to use a 90% confidence interval instead? » I must confess that I don't understand what you do here with the last two points. These are the lines built using lower/upper limits of 90% CIs for both Slope and Intercept. For now I don't think that's correct, since the final conclusion should be made using slope only. So I removed intercept uncertainty from calculation of 90% CI prediction line. » Dose dependent acceptance limits . » Could you please elaborate and enlighten me? » With simple words please, not with complex sophisticated code. I tried to reformulate eq4 used for acceptance criteria. If Beta1 should be less than 1 + ln(Theta2)/ln(r), then what is the PK level in the current dose point which is still acceptable? 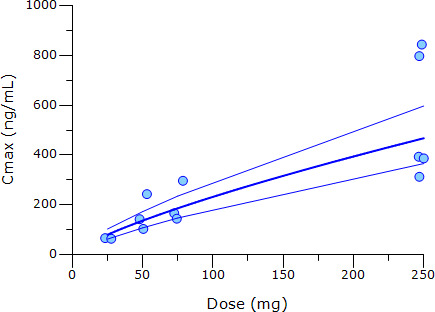 From my graph one could see that Dose = 50 is the last acceptable point. » The prediction area is calculated based on the dose values used in the study. 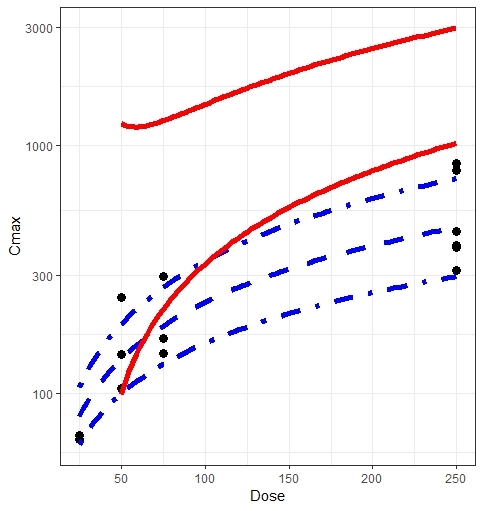 Should it not calculated on interpolated dose values to get more smooth area borders? » And why do you used the prediction interval as a fit visualization? AFAIK is prediction for future observations, but I think we had the goal to visualize the fit of our current observations. So would it not better to use a 90% confidence interval instead? Stand corrected. I removed CIs for individual observations since it is nonsense here. » Late but hopefully not too late insight. As I sometimes stated: All answers (of asked or not asked questions) are here. You only have to dig out what you are interested in. Anyway, not too late for me. I'll check the R code mentioned by Zizou and Helmut et al later. » Can you please elaborate where your difficulties arose? Able to obtain a point estimate of Rdnm but no 90% CI thereof? » Use this with the point estimate of beta1 from your model and its 90% CI limits and you obtain the 90% CI of Rdnm if I'm correct. According to his article, Smith use the formula EXP(beta0 + beta1*ln(dose)) to calculate each mean to get ratio Rdnm. so the value is Rdnm = 0.577402 (red digit from my sas). But this is equivalent to what you wrote so if you use the full precision figure we would have obtained the same values (90% CI of (0.477381, 0.698378)). I checked with the AUC data as well, they matches what's reported in table 2. » Could you please give a detailed example for what you did here? I just take the output and calculated some of the numbers according to Smith's article to reproduce his result. Those are slope and its 90% CI, and the corresponding criteria calculated with dose ratio r = 10 and θL and θU of 0.8 and 1.25, respectively. The rest are for information purpose only. EXP(d3.estimate + d2.estimate*LOG(250))/EXP(d3.estimate + d2.estimate*LOG(25)) * (25/250). Rdnm is the same thing but calculated with your code which is the one I use now since it's equivalent to previous one but much shorter. I guess that my explanation in previous post with this regard is not clear so I added both of them here. The last 2 are predicted geometric mean PK values at the dose levels of 25 and 250, as given in the 1st column in Table 2 in Smith's article. 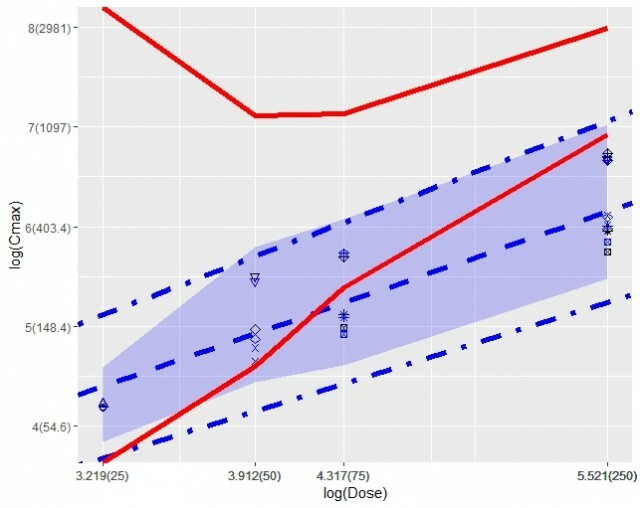 These 2nd part of the result are not really necessary to judge dose proportionality (though roh1 and roh2 are useful to know) but as I said, I prefer to reproduce all results as kind of "validation". By the way, Helmut, I don't know how to make a table (e.g. with 1 row) with heading here so I manually entered all values above; also, I copy/paste greek letter from elsewhere. Is there any helper section with BBCode for special symble and greek letters and table making? I vaguely recall there used to be a section with BBcode examples but couldn't find it now. » » Could you please give a detailed example for what you did here? Seen that you only used doses 25 and 250 for Rdnm although there are entries with doses of 50 and 75 mg. But since you are using the fitted (predicted) PK metrics it doesn't matter. And is equivalent to my suggestion. » By the way, Helmut, I don't know how to make a table (e.g. with 1 row) with heading here so I manually entered all values above; also, I copy/paste greek letter from elsewhere. Is there any helper section with BBCode for special symble and greek letters and table making? I vaguely recall there used to be a section with BBcode examples but couldn't find it now. Regarding greek letters: you can find the table of supported greek letters using the link above and copy paste it. Or to generate the symbol, make sure Num Lock is on and press the ALT key as you type the number on the numeric keypad. AFAIK using this method you are limited by Code Page 437 where ρ and some other letters are not presented and should be pasted from other page/app. » » Is there any helper section with BBCode for special symble and greek letters […]? You can download Smith’s paper here. We were exploring the Cmax data of Table I. » and the accurate result? » You can download Smith’s paper here. The link doesn't work anymore. Use this one instead. online 4 (0 registered, 4 guests [including 4 identified bots]).